So pleased to announce that I have a new column in the Orlando Sentinel’s A Better You section, which is a monthly insert into the newspaper. It’s on newstands TODAY March 20, 2013, a perfect beginning aligned with the Spring Equinox. Special thanks to Emily Rankin of Local Roots Farm to Restaurant Distribution for recommending some great farms to feature. This is Michele, we’ve met many times thru Sparkle and Cynthia. 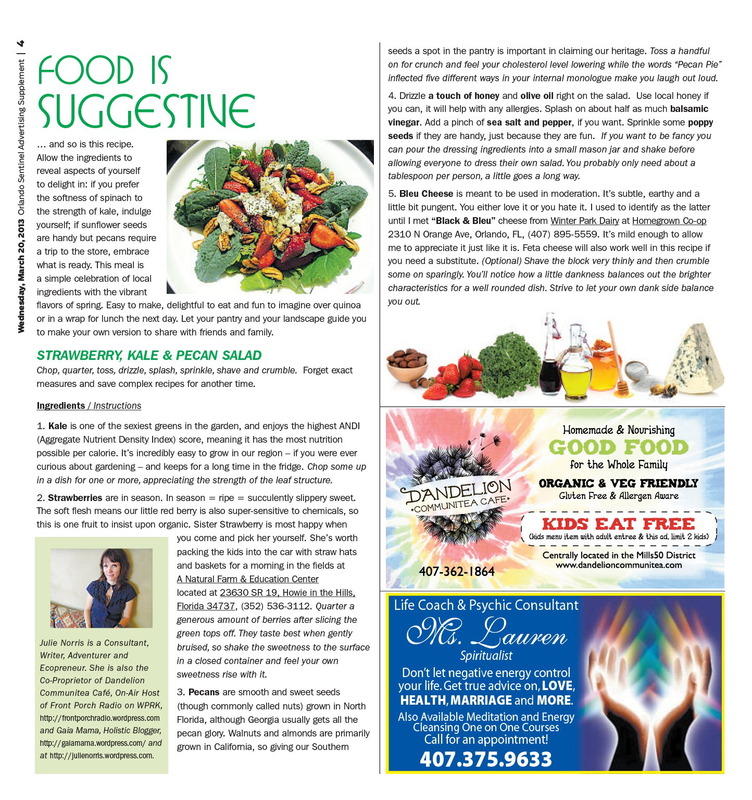 I just wanted to tell you that I saw this article when I was given this supplement at a Leu Gardens Gardening event last week. I read it a couple of days ago and I liked it so much. It was a treat for me to read it and get inspired. I’m not sure if it’s because I know you, or what, but your personality really came through for me in this article. I liked how it was so nice and playful and fun and loving and very informative all wrapped up in a great little package. And good food, too! I don’t believe I’ve read any of your writing before and I just thought I’d offer that feedback. I thought it was a very nice addition to the supplement. gee thanks michele! I totally do appreciate you taking the time to not just think those nice things, but also reach out and tell me. Helps give me encouragement to keep giving my best. Writing the next recipe today, so we’ll see it coming out soon!